Ribadiso is one of the places pilgrims who complete the French Way to Santiago remember the most. This small population centre completely transforms during the months when the route experiences high attendance, but always retains its defining quality, which makes it so greatly appreciated by travellers: to be one of the best preserved villages of the entire Jacobean route. Although it receives pilgrims throughout the year, it is very clear that Ribadiso changes between the winter and the summer months. The town is just a village with less than a hundred inhabitants, located in the parish of Rendal and a few kilometres from the important town of Arzúa. The place-name perfectly indicates its location: on the shore of the small river Iso, a tributary of the Ulla a little over twenty kilometres in length born in the nearby land of Boimorto to then flow into the main stream by the Portodemouros dam. A bridge crosses the Iso here, and this is the fundamental point in the history of the village. The bridge has a very long history that can be traced back to the times of the Roman Empire. It was part of the route that led from the current region of Compostela to the imposing Lucus Augusti and, as such, was used from the Middle Ages by pilgrims who came to worship the remains of the Apostle Santiago. The importance of the place is made clear by the establishment of a pilgrim hospital run by Franciscan nuns and, later, property of the powerful silversmiths guild of Compostela. A sixteenth-century text attests to the sale of the building to a private individual on the condition that he kept the hospital in good condition and that he treated the pilgrims appropriately. Surrounding the bridge and the hospital emerged a small nucleus, very similar to the one now preserved, almost frozen in time. 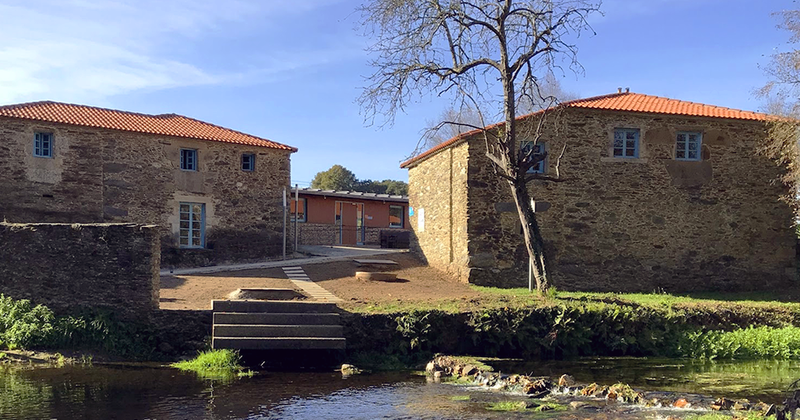 The restoration both the shelter and the surroundings have been subjected to since the 1990s perfectly shows the morphology of a traditional Galician agrarian village, with the houses crowded along the road, access to the river (an essential place for many pilgrims, who use it to cool down after the long and arduous descent from Melide) and wide fields of labour surrounding the town. During the restoration many windows were painted in a peculiar light blue colour that gives joy to the village. The old houses were repaired and adapted to their new use, since now they are focused on catering for visitors, who during the summer are counted by the hundreds, coming from all over the world, whether walking, cycling or riding. In Ribadiso there are many pilgrims who stop between stages, taking advantage of the fact that there are several hostels and catering establishments. Whether or not they stop, their next step will be demanding, because they have to face the tough climb to Arzúa and, if they decide to go further, a steep terrain all the way to the Alto de Santa Irene and the neighbouring municipality of O Pino. From Ribadiso, forty kilometres separate pilgrims from the finishing line of the Jacobean Route.